Your software applications are all about gathering data, analyzing it, and distributing it as quickly and cost efficiently as possible. 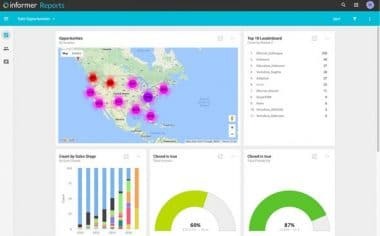 Increasingly, solution providers like you are choosing to embed reporting and dashboards into their products and services in a way that preserves their brand and betters user experience. Informer’s pluggable architecture also makes it ideal for integrating into other applications. Entrinsik partners can easily customize, brand, and embed Informer into existing software to create a cohesive analytics infrastructure. The referral program is ideal for consultants and application providers/ISVs who would like to promote the benefits of Informer to their client base while Entrinsik maintains first level sales and technical support. This also provides a great foundation for potential resellers. Entrinsik will also assist with co-marketing endeavors. Through the reseller program, ISVs can extend their current product offering to provide a more complete solution with a viable reporting and business intelligence tool tailored to their specific applications. The Informer Channel team will work with resellers in devising an overall go-to-market strategy, co-marketing efforts and sales training. Embarking on an OEM relationship with Entrinsik affords partners the ability to embed and white-label Informer as their own business intelligence application. OEM partners often utilize Informer’s plug-in technology to customize the look and feel, incorporate their company/product’s logo, and implement single sign-on along with other integration points back into their core applications. Entrinsik currently has several international distributors, but we’re always interested in expanding Informer’s reach across the globe. If you’re interested in adding Informer to your current catalog, please contact us. Entrinsik’s Informer Channel Team works closely with each individual partner in developing the perfect business intelligence (BI) offering along with honing in on the right messaging for the industry. Partners also get access to a software developers kit (SDK) for extending Informer’s platform via a plug-in framework and is designed for seamless integration and rapid deployment. And with a few clicks, partners can bundle any combination of reports, dashboards, security settings and more as an instant deliverable package to their clients. Many organizations around the world have integrated Informer to immediately enhance the value of their solution offering without time-consuming development. More than 1,500 organizations worldwide use Informer across various industries including higher education, insurance, manufacturing/distribution, healthcare, public safety, non-profits and others. Supported databases include Microsoft® SQL Server, Informix®, Oracle®, IBM DB2®, MySQL, Microsoft Access®, D3, UniData®, UniVerse® and more. For a personalized demonstration of Informer or to discuss Partnership opportunities in detail, send us a message or call us at (888) 703-0016. Already a partner? Click here to access resources for partners. The possibilities are endless in terms of how data can be combined and sorted. There’s not much you can do with a printed report. Now users can run analytics and create their own charts based on their specific needs. Craig Babigian FW Davidson & Co.
Want to become an Informer Partner?